A strength 2 orthogonal array (OA) of size n with k si-level columns (i = 1,...,k), denoted by Ln(s1...sk) is an n x k matrix in which all possible combinations of levels in any two columns appear the same number of times (Rao 1947). There is an OA library of over 200 OAs maintained by Prof. N. J. A. Sloane. This library has been recently updated by Dr. W. F. Kuhfeld of SAS at his OA site. This site contains all OAs listed in the Appendix of Kuhfeld & Tobias (2005) as well as new ones contributed by other authors. A simple introduction to OA can be found in most textbook on design of experiments (e.g. Chapter 7 of Wu & Hamada, 2000). A more comprehensive reference of OA is Hedayat, et. al. (1999). In a near-OA L'n(s1...sk), to reduce the run size, the orthogonality of some pairs of columns is necessarily sacrificed. The concept of near-OA (see Taguchi 1959; Wang and Wu 1992; Nguyen 1996b; Wu & Hamada 2000; Ma et. al. 2000 and Xu 2002) provides a genuine answer to situations when OAs are not available. An array is called a saturated design when ∑(si-1)=n-1 (e.g. a Hadamard matrix) and is called a supersaturated design when ∑(si-1)>n-1. The 2-level supersaturated designs were discussed in Booth & Cox (1962), Lin (1993), Nguyen (1996a), Tang & Wu (1997), Cheng (1997) and Wu & Hamada (2000) Section 8.6. The mixed level supersaturated designs were discussed in Fang, et. al. (2003, 2004). Additional references on this subject can be found in the references of these two papers. Here d212 (=4) is defined as the squared Euclidean distance between the observed and expected frequencies (or the sum of squares of the values in the difference matrix). Details of the NOA algorithm which uses this optimality criterion is discussed Nguyen & Liu (2007). The NOA GUI will pop up. Enter the the number of factors at the appropriate factor levels . Now click START, two windows will pop up. 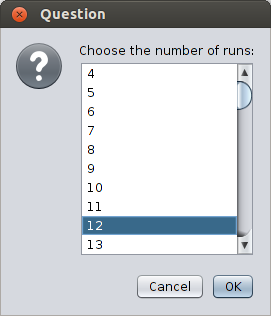 The first one asks you to choose the number of runs: choose 12 and click OK. 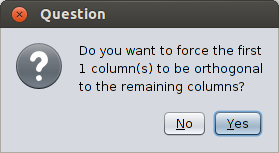 The second one asks you whether you want to force you want the first 3-level column to be orthogonal to the remaining columns: click No. Note that the START button has been changed to the RESET one. If you click this RESET button, the output will disappear and you can use NOA for a new design problem. Also note that the default random seed is the one obtained from the system clock and the default number of tries is 1000. You can change these default values if you wish to. E(d2) and its lower bound. NOA bound improves the one of Fang, et. al. (2003, 2004) when the constructed design is a near-OA. Also, unlike the latter, the former does not make the restriction that n should be divisible by si (i=1,...,k). Details of the calculation of this lower bound appears in Nguyen & Liu (2008). Note that for 2-level column arrays, the popular criterion E(s2)=4E(d2) (Eq. (14) of Fang, et. al. (2003)). Np (the number of dij>0 or the number of pairs of nonorthogonal columns in the array). A2 (measurement of the overall aliasing or nonorthogonality between all possible pairs of columns). The Cramer's V matrix: Cramer's V is the most popular of the chi-square-based measures of association between two nominal variables. The time in seconds NOA used to construct the above design. Note: The calculations of items 6-8 are described in Section 2.2 of Xu (2002). Items 10 and 11 are not printed when the constructed array is an OA (i.e. when f=0). Examples 1-4: mixed level OAs. Certain new OAs can be constructed by adding new columns to an existing array. As an additional example, the L60(21561101) can be constructed by adding sequentially five 2-level columns to the L60(21061101) in the Sloane OA library. Similarly, the L84(21461141) can be constructed by adding sequentially six 2-level columns to theL84(2861141) in the Sloane OA library. Examples 5-24: mixed level near-OAs. These examples correspond to those in Table 2 of Nguyen & Liu (2008). 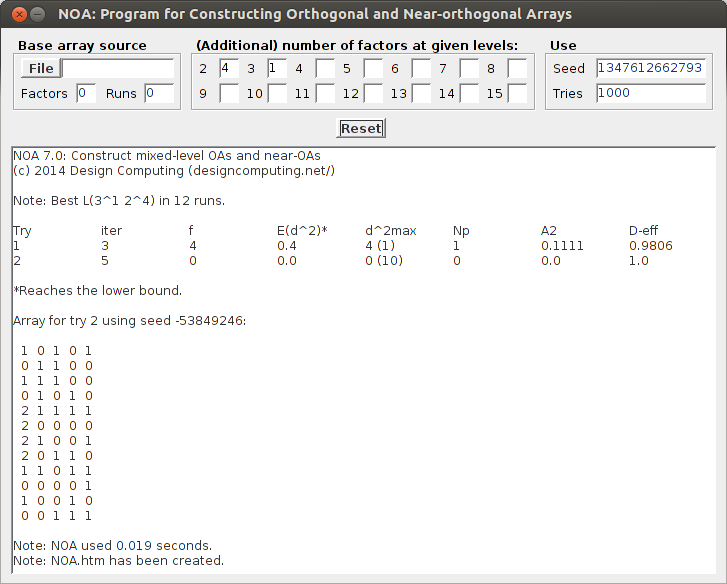 Some of the arrays in these examples were contructed by adding additional columns to existing OAs. As an additional example, the L'100(1042432), for example, was constructed by adding sequentially two 3-level column to the OA L100(10424). This new OA was in turn obtained by adding sequentially four 2-level columns to the L100(104) in the Sloane OA library. Examples 13 and 14 provide two solutions to the L'12(3227). In the second solution (example 14), the first two 3-level columns are orthogonal to the remaining columns. Examples 25-28: 2-level saturated and supersaturated designs. Examples 29-32: mixed level supersaturated designs. Like the designs in Table 2 of Koukouvinos & Mantas (2005), the ones in the last two examples were constructed by adding additional columns to the OAs L16(215) and L20(219) respectively. Booth, K.H.V. & Cox, D.R. (1962) Some systematic supersaturated designs. Technometrics 4, 489-495. Cheng, C.S. (1997) E(s2)-optimal supersaturated designs. Statistica Sinica 7, 929-939. Fang, K-T. , Lin, D. K. J. & Liu, M-Q. (2003) Optimal mixed-level supersaturated design. Metrika 58, 279-291. Fang, K-T., Ge, G., Liu, M-Q., Qin, H. (2004) Combinatorial constructions for optimal supersaturated designs. Discrete Mathematics 279, 191-202. Hedayat, A. S., Sloane, N. J. A. & Stufken J. (1999) Orthogonal arrays: Theory and Applications, New York:Springer-Verlag. Koukouvinos, C. & Mantas, P. (2005) Construction of some E(fNOD) optimal mixed-level supersaturated designs. Statistics & Probability Letters 74, 312-321. Kuhfeld, W. F. & Tobias, R. D. (2005) Large factorial designs for product engineering and market research applications. Technometrics 47, 122-132. Lin, D.K.J. (1993) A new class of supersaturated designs. Technometrics 35, 28-31. Lu, X., Hu, W. & Zheng, Y. (2003) A systematical procedure in the construction of multi-level supersaturated designs. J. of Statistical Planning & Inference 115, 287-310. Ma, C-X., Fang, K-T & Liski, E. (2000) A new approach in constructing orthogonal and nearly orthogonal arrays. Metrika 50, 255-268. Nguyen, N-K. (1996a) An algorithmic approach to constructing supersaturated designs. Technometrics 38, 205-209. Nguyen, N-K. (1996b) A note on the construction of near-orthogonal arrays with mixed levels and economic run size. Technometrics 38, 279-283. Nguyen, N-K & Liu, M-Q. 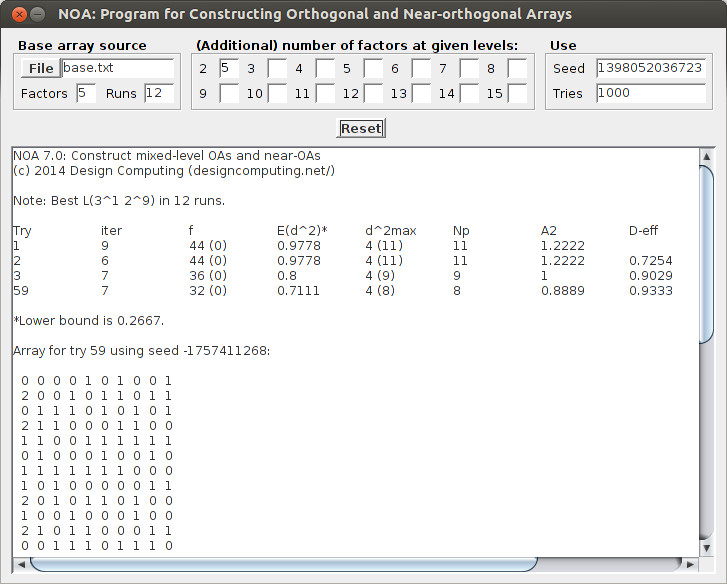 (2008) Orthogonal and near-orthogonal arrays constructed from incomplete block designs. Computational Statistics & Data Analysis 52, 5269-5276. Rao, C. R. (1947) Fractional experiments derivable from combinatorial arrangements of arrays. J. of the Statistical Society (Supp.) 9, 128-139. Taguchi, G. (1959) Linear graphs for orthogonal arrays and their applications to experimental designs, with the aid of various techniques. Report of Statistical Applications Research, Japanese Union of Scientists and Engineers 6, 1-43. Wang, J.C. & Wu, C.F.J. (1992) Nearly orthogonal arrays with mixed levels and small runs. Technometrics 34, 409-422. Wu, C.F.J & M. Hamada (2000) Experiments: Planning, Analysis and Parameter Design Optimization. New York: Wiley. 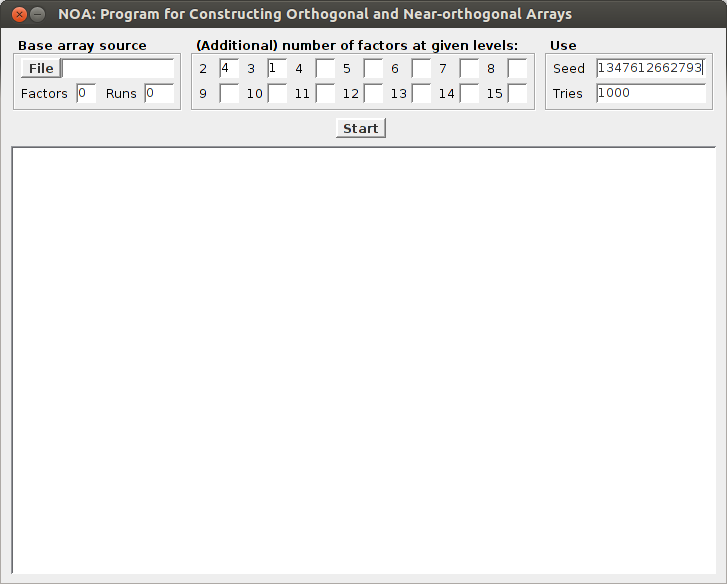 Xu, H. (2002) An algorithm for constructing orthogonal and nearly-orthogonal arrays with mixed levels and small runs. Technometrics 44, 356-368.